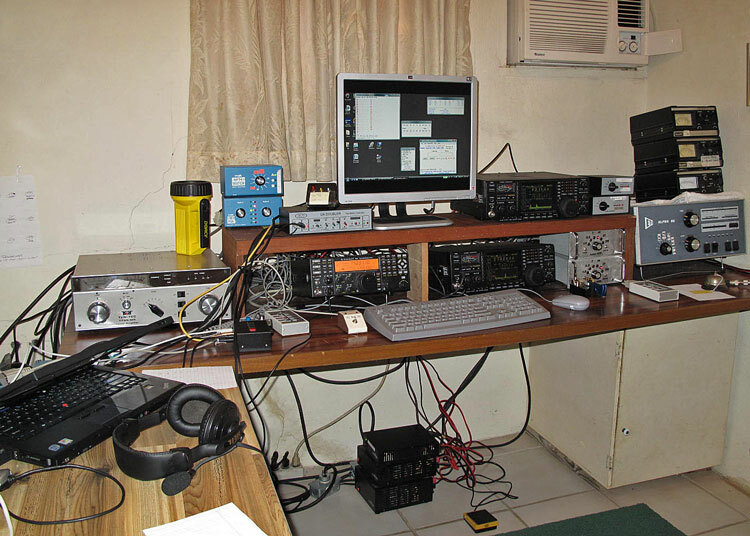 As you can see, the station has evolved considerably from a one-radio operation to a very effective single-op two-radio (SO2R) facility. 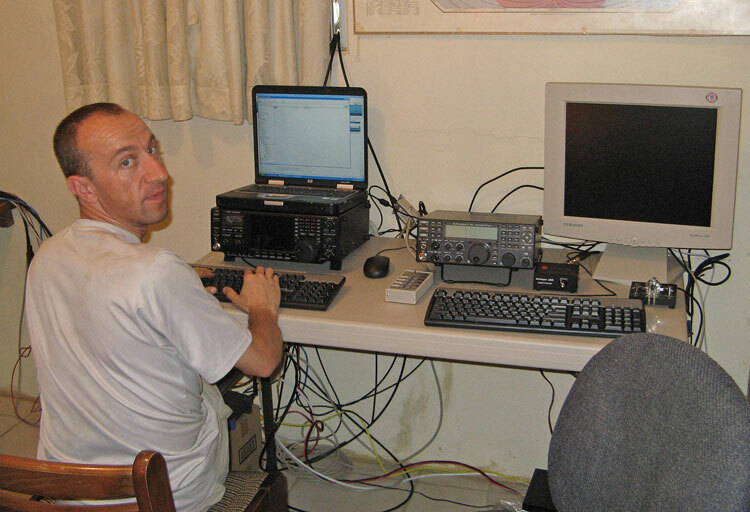 We have also done very successful multi-single operations, including ARRL DX CW 2010, in which Ed and John have a claimed world record score. 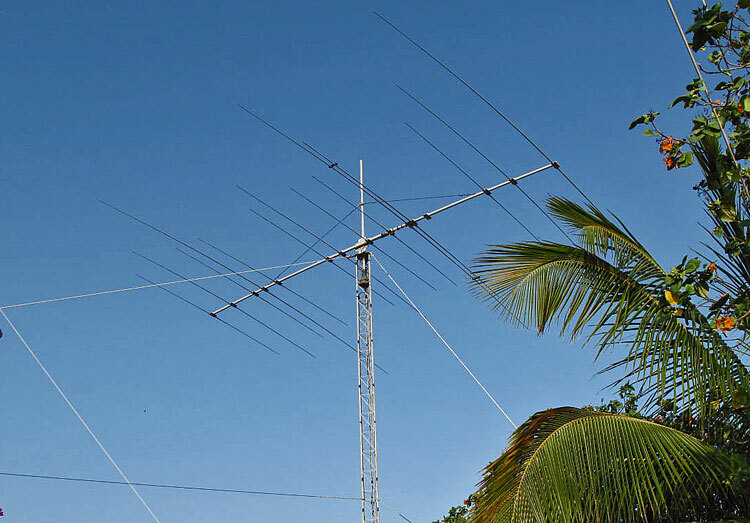 We tried multi-two in 2008 WPX CW, but that was pushing the capabilities of the available space and antenna spacing (i.e., it's hard to eliminate inter-station interference completely). The antenna refit party in February 2008 was a huge undertaking, involving a full week of work for four of us (John, Ed, Andy and Tom Schiller), plus a lot of assistance from Jean-Pierre, P43A. We replaced all tower segments above the base, raised the 10/15 tower and the back tower by ten feet, redid all guying, installed rebuilt rotors and all new coax and rotor cabling. 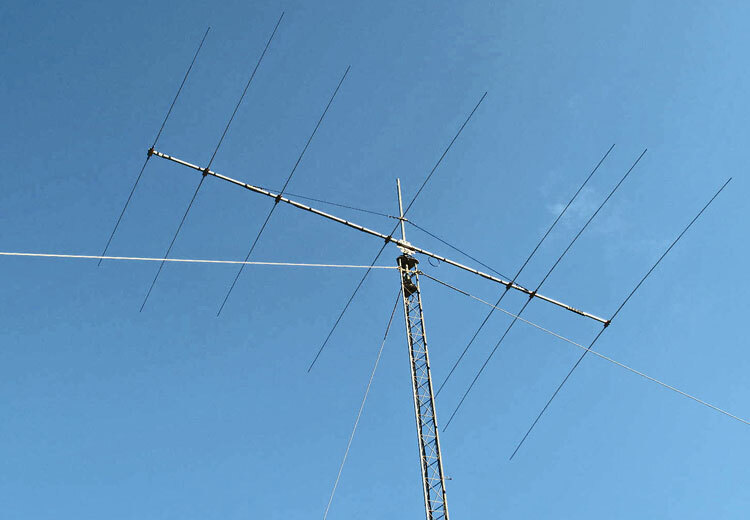 The antennas are also all new Force-12 designs (including our one-off N6BT special 5 element 15-2 element 10 on a 30-foot boom). 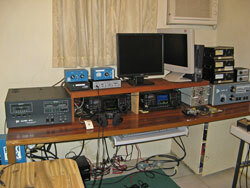 The new beverage system installed by KX7M and W6LD in May 2008 is a great improvement for low-band receiving. They used Google Earth to plot out the location, then a lot of bushwacking in the cunucu to lay out the four 500-foot beverages, all originating at a common point some 800 feet from the shack. The K9AY switchbox allows any beverage to be connected to either radio. 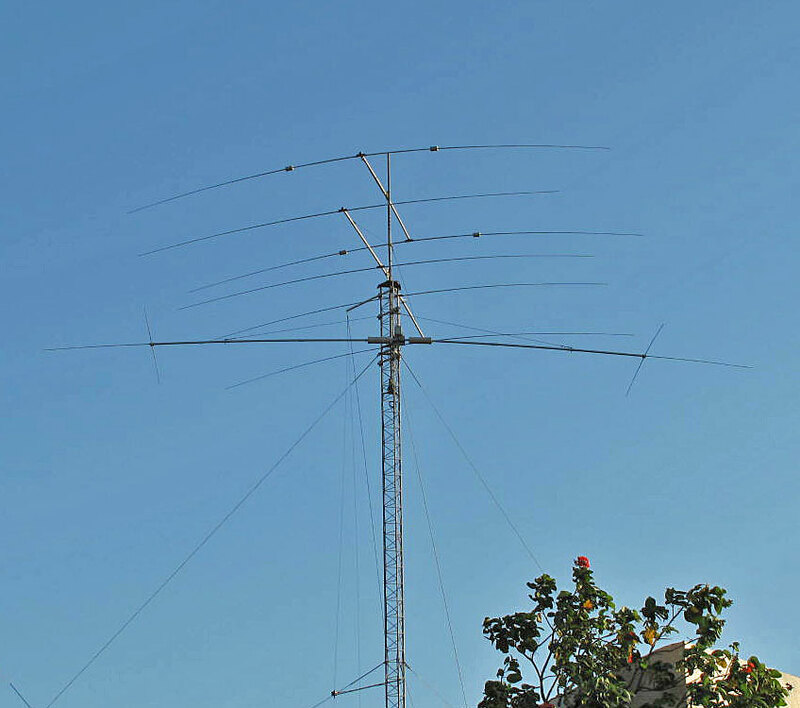 Future improvements we've been considering may include some form of vertical transmitting antenna for 160, and a small yagi aimed south on the back tower for SA. 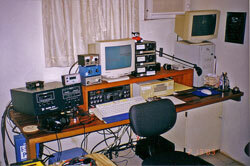 This is the original station, as used in May 2002 by Andy for WPX CW. Note old computers, one radio (FT-1000D). 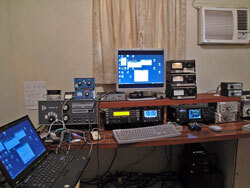 2007, ARRL CW. 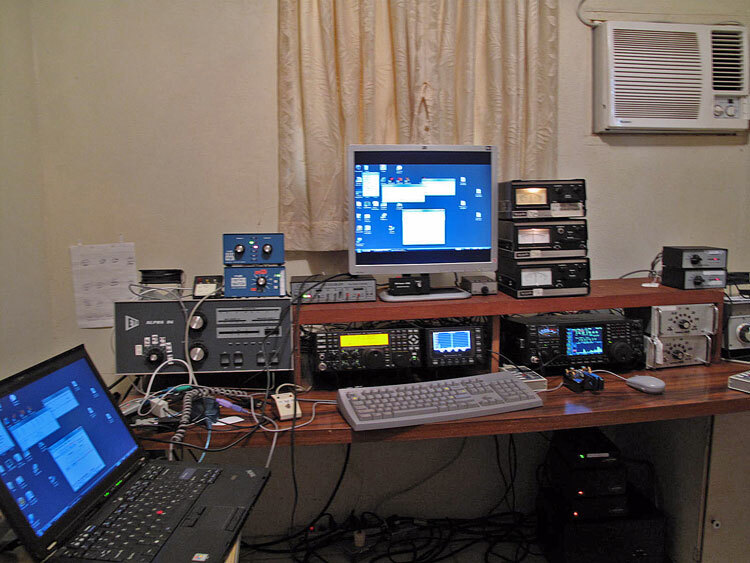 Radios are now Icom 756 Pro2s. Two Astron 12v power supplies are on the floor. New flat screen monitors are a distinct improvement. 2008 WPX CW. For a multi-two operation with W6LD, AE6Y, W0YK, KX7M, we ran two K3s at the main station desk and two more radios on the side table (see next picture). Note new K9AY beverage switchbox controller next to right K3. 2008 WPX CW. Here's Denny at the second operating position with a K3 and a Pro2. 2009 CQWW CW. Andy's setup for a SOAB High Power entry in the big one. 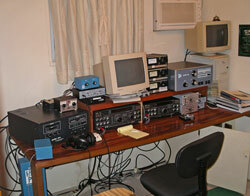 Note upper Pro2 being used as a bandscope for the K3; Ten-Tec Titan replacing the 87A that was home for repairs. 2010 WPX CW. Low Power setup featuring pre-production P3 panadaptor next to the K3. 2010 CQWW RTTY. Ed's amazing single-op setup with 3 radios, 3 computers, 3 keyboards and monitors, 2 hands, one brain! 2017 CQWW SSB. Andy is back to basics for the "Classic" mode with one radio. 2018 CQ 160 CW. Mat (DL4MM) at the helm for his third go at this contest. 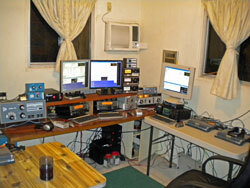 After our week-long work party in February, 2008, we have a whole new suite of antennas. Also three towers new from the base section up (and two of them raised ten feet over their previous heights), and an improved guying system. New as of May 2008 is a much improved set of beverage antennas. Credit for the work party goes to John W6LD, Andy, AE6Y, Ed, W0YK, and Tom N6BT. We got a lot of assistance from Jean-Pierre, P43A, while Andy, K2LE, P40LE also helped out at crucial points, as did Joop, P43JB. 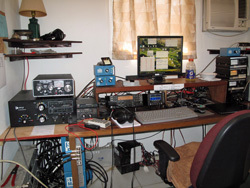 In May 2008, the beverage guru was Denny, KX7M, assisted by John. 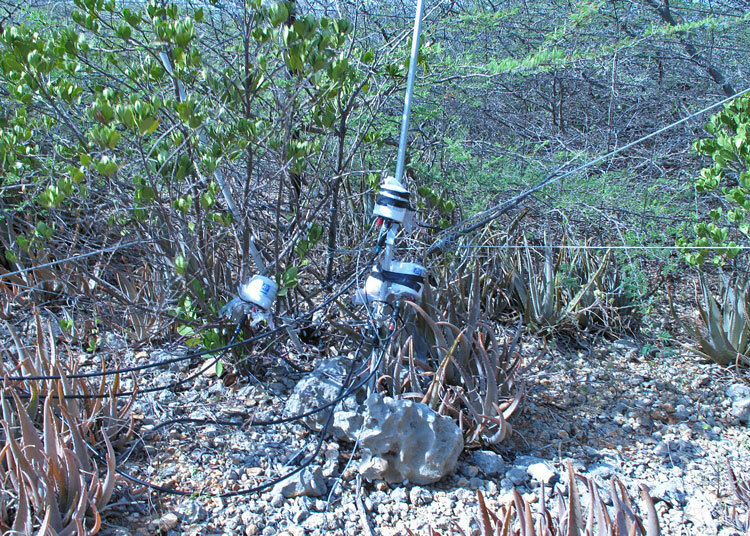 And in the "cunucu" (i.e., the large public property behind the house), we have four beverages (US West, US East, EU, and East-West) of about 500 feet each, with a common feedpoint about 800 feet from the house with separate RG-6 feedlines. A K9AY switching system in the shack allows any beverage to go to either radio. All sorts of tools, cables, accessories, etc. The station was designed primarily for a single operator as the antennas are too close for best operation in a multi-transmitter configuration. 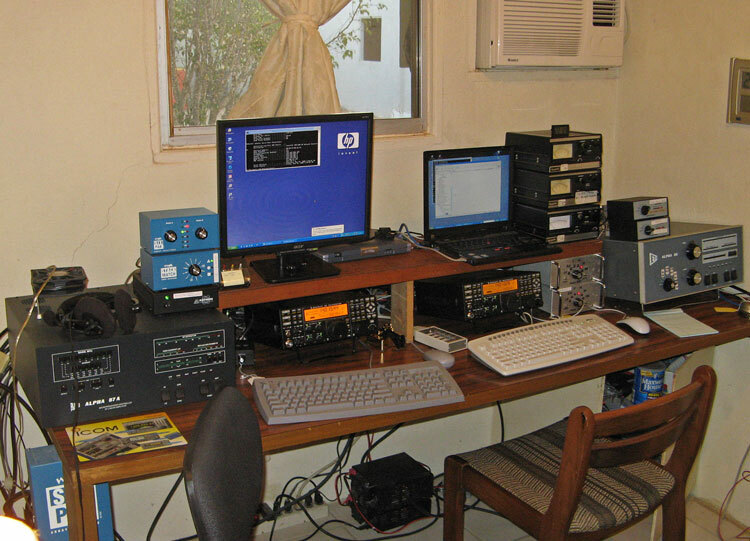 In 2004 we turned the sation into an SO2R (single-operator two-radio) station using the newly acquired FT-990 and adding appropriate filtering and switchboxes. Changing bands on either radio switches FilterMax filters for the appropriate band and changes the SixPak to the correct antenna. Band decoding is done by Bandmaster Decoders, which control the filters. A Top Ten DX Doubler switches inputs to the radios. 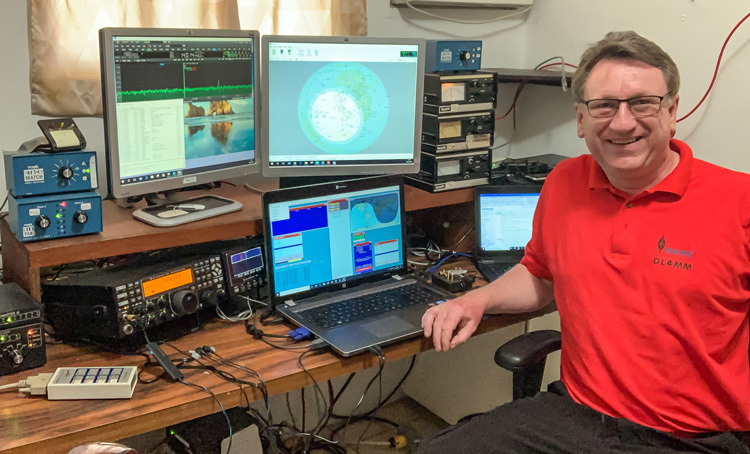 The Standard radio configuration is with two Icom 756 Pro 2s, though we also have an Elecraft K3 and an FT1000D, and lately we have been bringing down our own K3s as well. For example in our multi-two operation in WPX CW in May 2008, we used three K3s and one of the Pro 2s. We used to have a station computer, but it was an old one and we found it next to impossible to keep it working with up-to-date logging software, so everyone brings their own laptops instead. 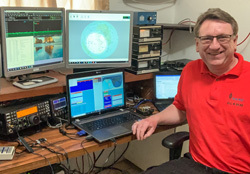 Three LCD monitors (17-inch and 19-inch) are on site along with several keyboards (including special mini keyboards that W0YK likes for RTTY). We have keyer interface and rig control cables for the on-site rigs. Internet is now high speed dsl with a wifi modem. The voltage on the island is 110V and 220V at 60 Hz; plugs are just like the USA. The Radio Room has 110 volt outlets for the radios and station accessories, along with 220 volt outlets for the amplifiers and A/C. There is a 220 outlet in each bedroom for the A/C. Station 12-volt power distribution is by Rigrunner boxes with Anderson Power Poles (extras on site - but best to bring matching cables if you have particular accessories that need 12 volts). 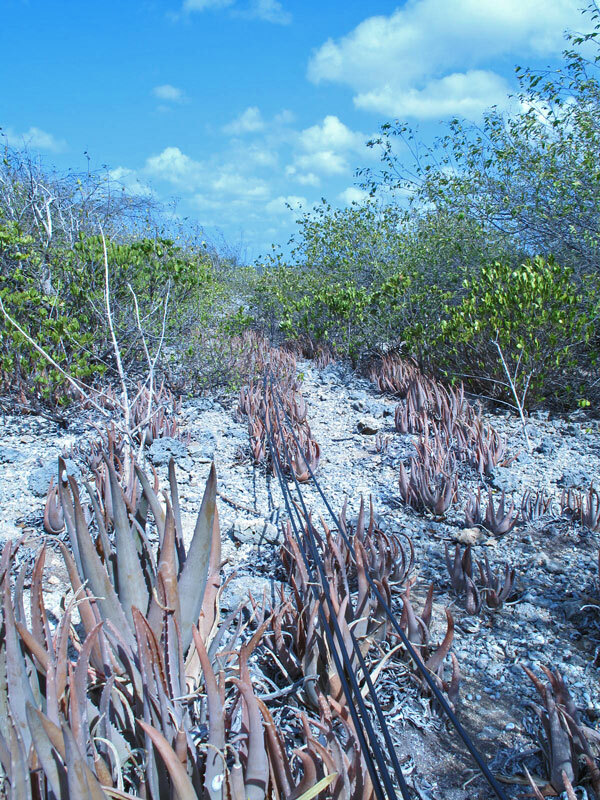 Unfortunately, Aruba is not a CEPT country, so there is no automatic reciprocity. Licensing is straightforward, though bureaucratic. The basic process is explained on the web site of the Aruba ARC. Basically you apply to the Aruban FCC (called the DTZ), which will issue you a license for a year, in the form of, e.g., P4/AE6Y. You can also get special contest calls, like P40L and P40Y valid for a month at a time. The first time you apply, the process takes two to three months or so to complete, so apply early. You pick up the license and pay for it on arrival, or we can arrange to have it picked up for you by Chris, P43C, for a small fee. There are several fees that must be paid to pick up the license. Being a small island, Aruba is a corrosive environment, and it is also fairly windy. As a result, at any given time, antennas may break, feedlines can become disconnected, rotors can get stuck, electronics can fail. Thus, any visitor to the house must understand that there is a possibility, as with any Caribbean site, that one or more antennas or items of gear may not be operable, and may not be fixable during your stay. We try to keep things shipshape, but can offer no guarantees, or refunds, in case of equipment failure.